Embrace the do-it-yourself spirit by making a batch of aromatic gin using your favorite vodka as the base. Relive Prohibition without all the pesky illegalities, bathtub hooch, and glamorous parties hidden behind secret speakeasy doors--okay, that last one sounds pretty great. 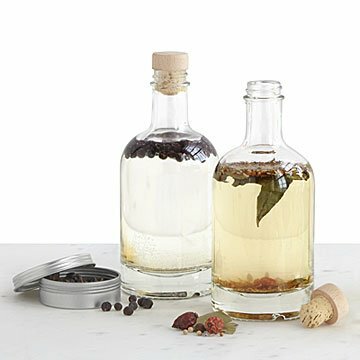 Filled with hand-selected and aromatic juniper berries, mixed spices, and more, this DIY gin kit lets you brew your own batch without a flurry of distilling equipment. Simply start with a bottle of your favorite vodka, which acts as a blank canvas, then add the included spices and botanicals. Let your ingredients steep for 36 hours before enjoying your very own happy hour-ready mix, touched with hints of lavender, sandalwood, and green cardamom. Two included bottles display your tipples with pride, while the small batch mix tastes great on the rocks, with a splash of tonic, or an aromatic addition to a Negroni. Made in USA. Kit yields 750 ml of gin. Bottles hold 375 ml each. He thinks I'm great at gifts now! My partner absolutely loves thoughtful gifts. This was his first birthday we have had together and I was stressed to find perfect gifts. When he opened this he was so excited! Now he thinks I'm really good at giving gifts and I'm happy he's happy. The ultimate gift for a gin loving scientist! My son loves infusing alcohol to make wonderful one of a kind new flavors ! He has a knack for it. This will give him the opportunity for yet another adventure! The kit had all the spices and botanicals to make to taste. The bottles in the kit were a perfect addition to make it personal. I added Alyson Thomas's Gin and Tonic glassware (found on UncommonGoods website) to round out the perfect gift. My Dad absolutely loved this gift. The only reason I dropped it one star is that you have to buy a bottle of Vodka to complete the kit, but without opening the kit I wasn't able to find any information on suggested types of Vodka. So I went to the liquor store and ask them for some help. It ended up being a great gift and it is incredibly unique. My father-in-law loves gin and thought this was a really clever gift. He was excited to try it! My fiance loves his Gin! It was a nice surprise and he loves it! The end result tasted pretty great!